We Complete Wedding Solutions take an immense pleasure in introducing our perfect range of services. Our wedding services cover everything right from budgeting till the execution, covering all aspects of perfect wedding.Since 2008, we provide our gamut services in Chandigarh, Panchkula and other surrounding areas in preparation of each &amp; every ceremonies starting from roka ceremony to honeymoon. 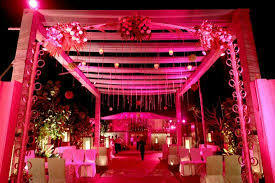 Our concern is to celebrate your lifetime occasions in personalised manner by keeping nitty gritty in arrangements. We provide best of our resources, contacts and all the required wedding services such as Venue Management, Theme Wedding, Stage Decoration, Varmala Themes, Floral Decoration, Catering, DJ Services, Bartending Services, Band &amp; Ghori Service, Lightning, Wedding Cards, Sweets &amp; Gift packing, Traditional stalls and Imported Fruit stalls, Photography etc.